In a seismic defeat for Latin America’s left, conservative Buenos Aires mayor Mauricio Macri has been elected president of Argentina. While the transition out of leftist Cristina Fernández de Kircher’s tenure will hurt many of the nation’s questionable alliances, none appears more fragile now than the ties Kircher fostered with the Islamic Republic of Iran. Macri – a pro-business, small-government candidate running as a member of the Cambiemos (“Let’s Change”) party – beat out Kirchnerist candidate Daniel Scioli 54.5 percent to 45.5 percent in Argentina’s presidential election last night. Sunday’s election was scheduled following the initial October vote, in which Macri came in second place but made the election close enough to force the nation’s first-ever runoff vote between the top two presidential candidates. Runoff elections are constitutionally mandated in Argentina should no candidate receive more than 40 percent of the vote. That night, Macri’s opposition candidate María Eugenia Vidal also defeated the ruling party candidate for the title of governor of Buenos Aires province, a title currently still held by Scioli. “We turned healthy rebellion into the decision to change, and today we are all very excited,” Macri said in his victory speech last night. He noted that he received a congratulatory call from Fernández de Kirchner before taking the stage, urging supporters to work with the opposition in both local and national politics. Fernández de Kirchner leaves Argentina having pushed its inflation rate to the world’s third-highest in 2014, devastating its economy while developing close diplomatic relations with international pariahs like Venezuela, China, and Russia. But it is Fernández de Kirchner’s decision to bring her nation closer to Iran that may have tilted the scales for the opposition. Fernández de Kirchner made a pact in 2013 with the nation of Iran to work together to solve the case of the deadliest terrorist attack in Argentina’s history: the 1994 bombing of the Argentine-Israeli Mutual Society (AMIA). Iranian and Hezbollah members have been suspected for decades of having orchestrated the bombing, but Fernández de Kirchner nonetheless trusted Iranian dictator Ayatollah Khamenei enough to sign a pact in which both sides agreed to form a “commission of truth” to find the killers. The case remains unsolved. With out-of-control inflation and an economic crisis making life hellish for Argentines on a day-to-day basis, the AMIA case had largely disappeared from the public eye until January of this year, when a Jewish-Argentine prosecutor named Alberto Nisman announced that years of research had led him to conclude that Fernández de Kirchner was accepting bribes from the Iranian government in exchange for protecting the perpetrators of the AMIA attack. The day before Nisman was to present his 300-page report to the Argentine legislator, he was found dead in a pool of blood in his apartment, with one gunshot wound in his forehead. Argentines did not appear to buy the claim that Nisman’s death was a suicide, either, though many also failed to believe Fernández de Kirchner had nothing to do with it. 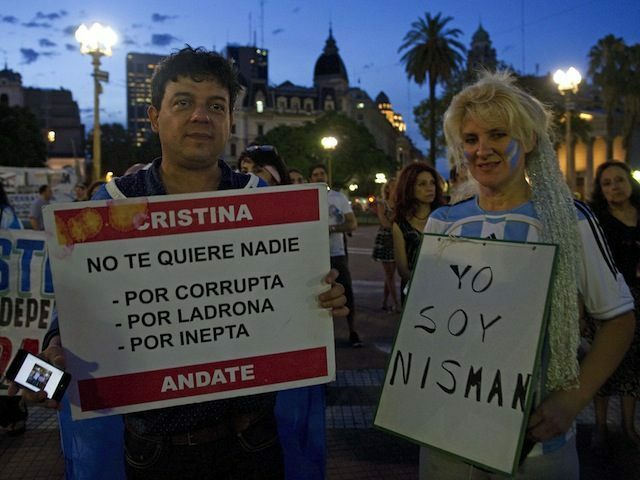 “Islamic Fundamentalists Killed Nisman,” read signs at massive protests in Buenos Aires throughout January and February. The criticism of Fernández de Kirchner intensified when media reported that Nisman had drafted an arrest warrant for her and Foreign Minister Héctor Timerman in relation to the AMIA case. At one February rally against the president, 400,000 Argentines took to the streets of Mayor Macri’s capital city. The government condemned them. “We have seen signs with insults and offenses directed at the President… people telling her to die, that she is a mare, and they have no shame in exhibiting themselves like this,” Aníbal Fernández, President Cristina Fernández de Kirchner’s (no relation) secretary general, said of the march. In addition to insulting those calling for justice against Iran for Nisman, the Argentine government also insulted the late Nisman personally, running newspaper advertisements calling his argument “plagued with contradictions and a lack of logic” and, in one case, going so far as to call him a “scoundrel” and “wretch” who enjoyed the company of prostitutes. Macri also invited Judge Sandra Arroyo Salgado, Nisman’s ex-wife, and Nisman’s daughter to attend a November debate between himself and Scioli. He was later criticized for not having mentioned Nisman during the debate. Macri replied he did not find the time, though their presence as his distinguished guests should make clear his position on the case. The Iranian government and its state-run media have yet to comment on Macri’s victory. Instead, Iran’s Fars News is looking ahead to an even more devastating potential loss: in Venezuela’s December 6 elections. Venezuelan dictator Nicolás Maduro has been an even more vocal supporter of the Ayatollah’s regime, and in gratitude Ayatollah Ali Khamenei issued remarks this Monday following his meeting with Maduro in support of the socialist government. “The US aims to destroy the inspiring resistance of the Venezuelan nation and government through pressuring the country,” Khamenei said, adding, “Today, the policies of the arrogant powers are disturbing man’s life like a big disaster and the only way for independent countries’ progress and victory is resistance and reliance on people.” A recent poll found that 63.2 percent of Venezuelans support the anti-socialist opposition, while Maduro’s personal approval rating languishes between 20 and 25 percent.